Business focus is changing from data management to intelligent action. Artificial intelligence (AI) can add significant power and effectiveness to human processes by recognizing patterns across massive amounts of historical data. The Intel Inside® Program (IIP), a co-branding members-based marketing program designed to help consumers identify which products use Intel® technology, receives ...thousands of reimbursement claims per month. Intel’s Global Audit Team (GAT) selected claims to audit for non-compliance, but the sheer volume of data made it difficult for humans to see the patterns that help better predict non-compliance. 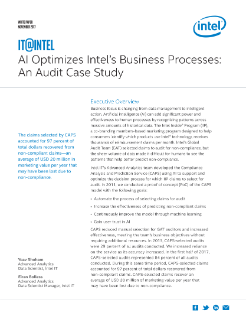 Intel IT’s Advanced Analytics team developed the Compliance Analysis and Prediction Service (CAPS) using AI to support and optimize the decision process for which IIP claims to select for audit. In 2011, we conducted a proof of concept (PoC) of the CAPS model with the following goals of automating the process of selecting claims for audit; increasing the effectiveness of predicting non-compliant claims; continuously improving the model through machine learning; and gaining user trust in AI. CAPS reduced manual selection for GAT auditors and increased effectiveness, meeting the team’s business objectives without requiring additional resources. In 2013, CAPS-selected audits were 29 percent of all audits conducted. We increased reliance on the service as its accuracy increased. In the first half of 2017, CAPS-selected audits represented 84 percent of all audits conducted. During this same time period, CAPS-selected claims accounted for 97 percent of total dollars recovered from Non-compliant claims. CAPS-selected claims recover an average of USD 20 million of marketing value per year that may have been lost due to non-compliance.